The HS Series - available in any colour you like, as long as it's black. Or white. NAMM 2014: We raved about Yamaha's HS Series monitors back in October, awarding them 4.5 stars from a maximum five and praising their balance. They've clearly proved themselves in the marketplace as well, because now the firm has unveiled a new white colour option for the whole range. Yamaha says that, other than the colour, the white monitors specs are exactly the same as their more traditional black counterparts. The white option won't cost you any extra either, which is a welcome change, and will be available from March onwards. Following their introduction at Frankfurt Musikmesse 2013, the second generation of Yamaha's HS Series of nearfield studio-quality powered monitors have proved extremely popular in professional and home studios the world over. 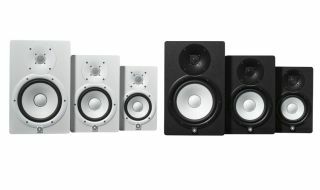 Now the 3-strong full-range lineup - HS5, HS7 & HS8 - are all available in a stunning white finish! The HS Series - completed with the HS8S 150w powered subwoofer - shares the same design philosophy as the legendary NS-10M Studio Monitors and the subsequent highly-acclaimed MSP range, and is specifically designed (and priced) for the project home studio market. However, as is to be expected from Yamaha - an acknowledged world leader in nearfield studio monitor design and innovation - the HS range can easily hold its own against far more expensive monitors. Built to last with high-grade components, the powerful 2-way bi-amped HS5 (70w), HS7 (95w) and HS8 (120w) studio reference monitors are ideal for mixing and music production, delivering an exceptionally smooth, flat and - most importantly - accurate response. To uphold their reputation for delivering exceptionally clear, natural and detailed sound, Yamaha engineers designed new transducers for the HS range and produced proprietary technology that reduces audible noise - often caused by air vibrations - by up to 6dB; yet another example of the brilliant blend of design, technology and materials that will satisfy even the most demanding of music producers. And now they get to choose between two splendid colours, too! New models HS5W, HS7W and HS8W are available from March 2014 and will cost the same as current models.